Leaders, coaches, mentors, parents, and consultants all like their own ideas. “If people would listen to me and do what I said,” we think, “things would get a lot better around here.” The trouble is, everyone else is thinking similar thoughts regarding their own ideas. Ideas have their place. As a leader, you may have ideas based on your experience. Share them. Others will benefit. Ideas tend to reduce discussion, while questions increase it. 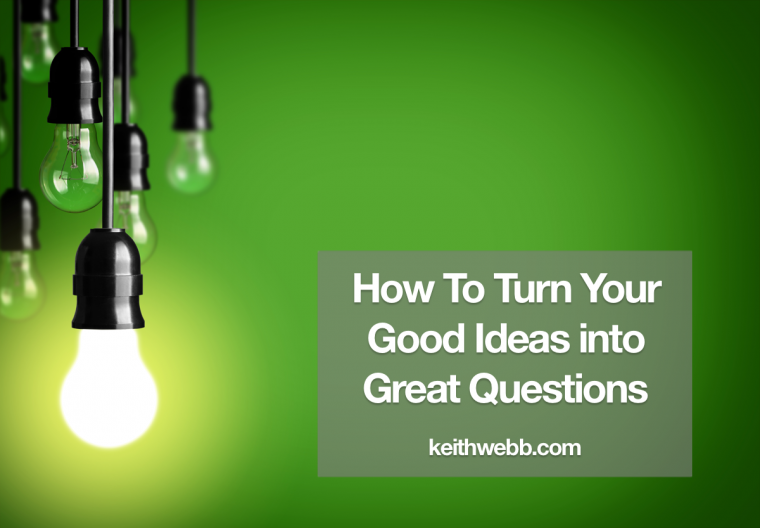 Your ideas are known to you, while questions draw out new ideas. Ideas often focus too early on how-to, while questions explore objectives, meaning, and priorities. Ideas narrow options, while questions broaden options. When a leader shares an idea, it tends to limit discussion. Instead ask questions. Begin with your idea. It is usually too specific, too focused, and an answer with too many assumptions built into it. Broaden the idea. Take that idea and broaden it to the category or topic behind your specific idea. This is your idea in a sentence. Now turn it into a question. This is the kind of question that leaders usually ask when they turn their ideas into questions. I call these My-Idea Questions. You can see the idea right in the middle: “borrow money.” While this is a question, it’s not a great one because it limits discussion to what’s on your mind and risks manipulating the person to your idea. You’ll damage the relationship if people sense manipulation. How are you going to finance that? This questions takes your idea, “borrow money,” and broadens it to the category of finance, allowing you to ask an open question that can draw out any number of ideas. Doing the 3 steps above takes practice. Especially, moving from My-Idea questions to open questions. Here are a few examples that have been changed into a great questions that still get at the topic. I have a helpful book on managing teams, would you like to read it? How could you improve your ability to manage your team? Have you thought about firing him? What options do you see in working with him? What if we launched a Facebook marketing campaign? How could we expose more people to our products? It’s important to understand that you still influence the topic of the discussion, yet, without controlling the ideas or the outcome. Your open questions help people explore and gain perspective. You influence with questions rather than ideas – and that’s empowering. The ideas that emerge during the discussion can be examined, built on, and evaluated. By using great questions, we can help people own the process and the product of the discussion. Question: What effects have you seen from asking questions instead of sharing ideas? You can leave a comment by clicking here.